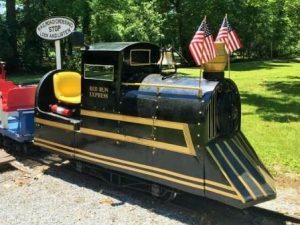 The Township owns and operates a miniature train called the Red Run Express located at Red Run Park in Rouzervillle, PA. The Township Public Works and Parks Personnel maintain the train and grounds. The train is engineered by citizens who volunteer their time and talents to engineer the train each Saturday and Sunday throughout the summer. UPDATE: At the FEBRUARY 20, 2019 Supervisor’s Meeting the Board of Washington Township Supervisors authorized the Township to dissolve the Train Commitee. If you are interested in making young folks happy by providing free train rides for them, please contact Vernon Ashway at the Township office at 717-762-3128. The Township will provide the needed training to operate the train. Sundays only in May and September from 1-4 PM. Saturday and Sunday in June, July and August  from 1-4 PM. (Also summer holidays). Rides are FREE—donations are accepted. operation are dependent on availability of volunteers.